Thinking about using QuickBooks for inventory tracking? Using QuickBooks as an inventory tracking tool and want to better understand it? Outgrowing the inventory tracking feature set within QuickBooks? Tracking inventory is a very big undertaking for a small business – more than many realize. I certainly feel your pain and level of concern when it comes to inventory…lived it right along with you! You see, before I started my consulting practice, I was the CFO for a $15 million manufacturing firm. During that time, I was the guy in charge of managing over $4 million worth of inventory. Mins and maxes? Reorder points? Long lead time items? Multi-location tracking? Selling on the internet? I have deep experience with all of these things over the last 30 years. 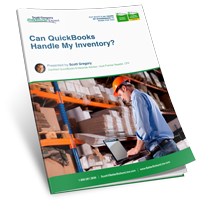 Is The Quickbooks Inventory Module Right For You? QuickBooks Pro, Premier and Enterprise [PDF] (the desktop versions) all contain an inventory module that will allow your business to track inventory parts, non-inventory parts, services, and other charges as well as create and receive against purchase orders for them if you desire. QuickBooks Online also has some basic inventory tracking capabilities, which may work for a small subset of businesses. The Premier and Enterprise editions of QuickBooks go further and allow you to track inventory assemblies and bills of material as well as offering the ability to create and track sales orders and backorders for your customers. In addition, an entire eco-system of inventory add-on software for QuickBooks (Desktop and Online versions) exists that offer the capabilities for: bar coding, lot and serial tracking, e-commerce, shop floor tracking and so much more…. Want Expert Help To Sort It All Out? As mentioned earlier, I have over 20,000 hand-on hours of field-tested experience and have been working with inventory, accounting, finance and information technology for over 30 years now, as well as the hands-on experience of managing a $4 million inventory. Tap into that expertise for a consultation on the specifics of your situation and from there, we can work together to discuss how QuickBooks and/or add-ons for QuickBooks can play a role in the tracking of inventory within your business.